Please select a lesson program for your child from the options below. Be sure to review the lesson level descriptions, what to bring for your day at Dodge Ridge and the rescheduling and cancellation policies. 2 hour program, featuring one on one instruction with a caring and qualified instructor. 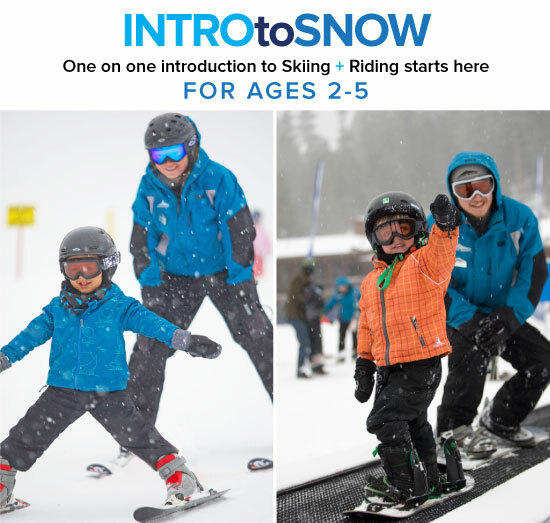 Intro to Snow is always recommended for 2 & 3 year olds or for 4 & 5 year old first timers. Instruction is customized to pique your child’s interest thru instruction both inside the Kid’s Club and outside in the Children’s Learning Area. Intro to Snow – Ski & Ride – 2 hr lessons are available daily on the hour as early as 9am and as late as 2pm. Must call to reserve (209) 965-3474. When your child is ready to graduate from the Intro to Snow program, talk to their instructor about the next and best program for their progress. All prices subject to change without notice. All sales are final. Same day lesson reservations are not available by phone or online and are only available on a first-come, first-served basis in person from Guest Services in the Family Lodge. The following lesson level descriptions are a list skills which will be taught in each specific lesson level. FOR YOUR CHILD’S BEST EXPERIENCE, IT IS MANDATORY THAT ONLY KIDS BE PERMITTED INTO THE KINDER ROOM BEYOND THE CHECK-IN LOCATION. WEEKENDS & HOLIDAYS Arrive In Guest Services for check-in At Least 1 Hour before your lesson time. WEEKDAYS (NON-HOLIDAY) Arrive In Guest Services for check-in At Least 30 Minutes before your lesson time. Helpful Tip: Our Guest Services department opens for check-in as early as 7:30am on weekends and holidays and as early as 8:00am on weekdays (non-holiday). they’ll direct you to the “Private Lessons Meet Here” A-Frame sign (located on the snow behind the Family Lodge), where you child will meet their instructor. The lesson will begin with the instructor getting your child fitted for their ski or snowboard equipment, using this time to teach them about the equipment, how to put it on and how it all works. After the rental fitting, they’ll move to the Children’s lesson area for skiing and riding. Child pick-up for Intro To Ski + Ride lessons will be at the “Private Lessons Meet Here” A-Frame sign. Helpful Tip: When taking lessons or renting equipment on consecutive days, it can save time on your child’s check-in each day if you have our rental staff keep your rental skis and snowboards off to the side with your name attached to them overnight to avoid the need for refitting equipment each day. Watch your child progress as they work their way up through levels 1 to 6! * We are diligent in maintaining these class sizes, though from time to time we may exceed these numbers due to peak visit days. The following describes the skills that will be taught at each lesson level. FOR YOUR CHILD’S BEST EXPERIENCE, IT IS MANDATORY THAT ONLY KIDS BE PERMITTED INTO THE KID’S CLUB ROOM BEYOND THE CHECK-IN LOCATION. Helpful Tip: You can arrive at Guest Services for check-in as early as 7:30am on weekends and holidays and as early as 8:00am on weekdays (non-holiday). Guests may check-in early for Afternoon (PM) Half-day lessons in order to pick-up lift tickets and to get rentals fitted for use prior to their lesson. 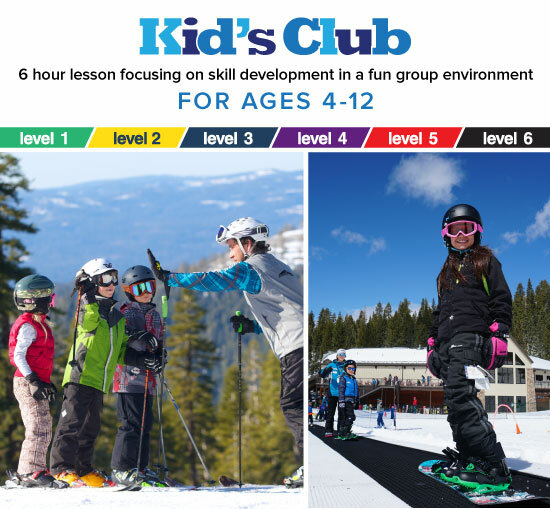 Once the Kids Club doors open for afternoon half-day lessons, your child can be dropped off in Kids Club to meet their group and instructor. they’ll direct you to the Kids Club entrance (also located inside the Family Lodge), where you child will get fitted for their skis & boards, meet their instructor & group, and head out on the mountain for their lesson. Child pick-up for All Day Kids Club lessons will begin at 3:15pm. During pick-up your child will receive a report card of everything accomplished during the day, along with suggestions for next steps from their instructor. Helpful Tip: When taking lessons on consecutive days, it can save time on your child’s check-in each day if you have our staff keep your rented skis and snowboards reserved on the side to avoid the need for refitting equipment each day. Dietary Restrictions: we can accommodate vegetarian and gluten free diets. Parents are welcome to pack a lunch or snacks for children. WE DO ASK THAT THE LUNCH AND SNACKS NOT CONTAIN ANY NUT PRODUCTS.